Antique Uzbek Ikat Textiles – Ikat is a dyeing technique that developed independently across different cultures and continents. Since it was on the Silk Road trade route, Uzbekistan became a natural center for Ikat textile production. Some sources say Ikat first appeared in Uzbekistan in the 10th century, some say it wasn’t in full bloom until the 17th. In the early 20th century, at the pinnacle of its production, Itak texiles in Margilan, in Uzbekistan’s Fergana Valley, were created in 120 workshops with a division of labor split by techniques; some workshops produced the raw yarn, some engaged in dyeing and others did the weaving. This system is still being followed today with fewer workshops. The technique used in Ikat textiles is called “resist dyeing” in which methods are used to “resist” or prevent the dye from reaching all the cloth, thereby creating its bold, abstract patterns. (Varieties of resist dyeing include tie-dye and batik.) Ikat textiles are dyed before weaving. Silk was the original fabric used to weave Ikat textiles, but today both silk and cotton is used. The Ikat dyeing process is complicated and time consuming, with tying and untying rhythmic motions, until all the colors are incorporated into the design and the pattern is complete. Seven colors had been maximum number of colors used but this tends to be rare now. The look of Ikat textiles is described as hazy, dreamy, and impressionistic because of the ways the dyes bleed slightly into the resist areas. Bright primary colors such as red, yellow and blue – and their variations – are used with natural colorants. In older times, the designs of antique textiles were gleaned from plants, fruits, animals and insects such as trees, pomegranates, birds, ram’s horns and spiders. Today, the designs are abstract and geometric patterns. In Uzbekistan, by the 17th century, since the population generally wore similar clothes, such as tunics, trousers and robes, royals and their families needed a way to distinguish themselves from peasants and craftsmen. With the development of Ikat dyeing, royals expropriated the cloth to demonstrate their wealth and social standing. Ikat textile production in Uzbekistan was a Master Designer and apprenticeship craft until the Russians conquered Uzbekistan in the 1860’s and centralized production, using chemical instead of natural dyes. The secrets of Ikat dyeing were safeguarded by certain families and with Uzbekistan independence in 1991, the old traditional ways of binding, dyeing and weaving returned. The Ikat textiles are once again a craftsmen highly valued skill and art. The wearing of Ikat textiles has been an important part of forging of the Uzbek identity. Today, in urban areas, it is uncommon to meet people wearing traditional Uzbek garments and clothes, but the clothes are worn in all of Uzbek society for traditional festivities and holidays. In rural areas, clothing made with Ikat textiles is still worn as everyday garments. Besides fabric for clothing, Ikat textiles are used by interior designers for wallpaper, lampshade covers, furniture upholstery, wall hanging tapestries, duvets and pillows. Fashion designers use Itak textiles for jackets, scarves, bags and modern dress fabric. Beginning in 2008, modern contemporary rugs inspired by the antique Ikat textile designs are made in the usual rug weaving, knotting or tufting techniques, but can closely resemble the designs seen in the Uzbek robes. 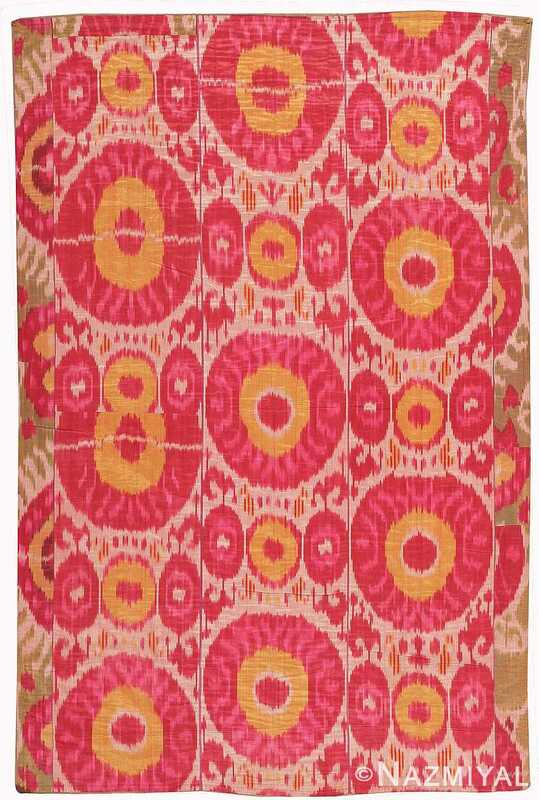 In the tribal tradition, this Uzbek textile features bold colors and woven ikat patterns.